Preparing to leave our jobs, rent our house out and set off around the world in a completely inappropriate car sounds glamorous and exciting. The reality is somewhat different – it takes planning and involves A LOT of boring paperwork. It turns out you don’t need to travel very far to get caught in a maze of red tape. The first excessively complicated procedure that we tried to follow wasn’t at a remote border post mid-way through the ‘Stans… it was at the Post Office. In order to satisfy other bureaucratic requirements later on the journey (we need a Russian translation of our driving licenses to drive into Russia, for example), we decided to apply for an International Driving Permit (IDP). An IDP is an extra document that we need to have (along with our actual UK driving licences) to drive in certain countries. It also translates your driving license into several different languages – Russian being one. There are details of how to apply online, but you can’t actually apply on the internet. 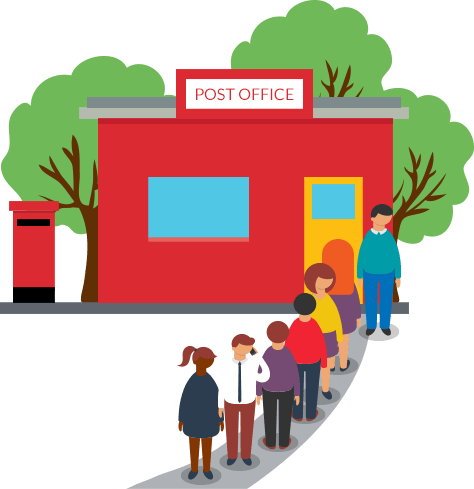 You have to go to a real Post Office with your driving license, another form of ID, a passport sized photo of your face, and £5.50. When you get there, you are given the form that you need to apply for the IDP. So far, so straightforward (sort of). However, only certain Post Office branches offer this service, so the next challenge was to find one. The Post Office website lets you search for this (hooray! ), and while our nearest Post Office branch wasn’t on the list, there was another option about a mile away. So I walked to the next-nearest Post Office branch. I brought my passport, my driving license, my small photo and my £5.50. I went in and asked to apply for an IDP. But they “don’t offer this service any more”, and suggested I go to Birmingham instead. Going all the way to Birmingham wasn’t appealing, so I went home, had another internet search and judged that I might be able to get one in Coventry instead, where I work every day. I went to the Post Office on my lunch break to find a long, snaky queue winding its way around the building. There were only two members of staff, and about 40 people waiting. So I waited… and waited…. And waited a bit longer, hoping that the waiting wouldn’t be in vain and that this Post Office actually would let me apply for the IDP. Eventually I got to the front of the queue, asked to apply for an IDP, and was given an application form (yay!). I then had to go away and fill in the form (which I did), and come back with my documents. It wasn’t a long or complicated form, and was just a repeat of the information on my actual driving license. I copied the details from the license onto the form, and went back to submit my documents. “What sort of paper should it be printed on?” I asked calmly, trying to be friendly, outside, not feeling so upbeat on the inside. Sensing that this wasn’t going to end well for me, and feeling the mounting frustration of the 40 or so people standing behind me in the snaky queue, I left the Post Office and looked for some shiny paper. As I don’t actually have a working printer, and suspecting that the “shiny paper” issue might crop up again over the next few months when applying for visas, I used Microsoft Paint to make my passport photo into eight squares on a 6×4 photograph, and ordered four photographs on the shiniest photo paper possible from Tesco. At only 15p per photo (60p total), this was a bargain compared to going to a photobooth, meant the photos would be exactly the same as those in my passport, and that I’d have 32 of them. Once I had the photo-on-the-shiniest-shiny-paper, I went back to the Coventry Post Office (another day, another thrilling lunch break spent in a snaky queue), and waited. When I eventually reached the front of the queue I had to fill the form in again, and then I gave my documents in. The Post Office clerk then said he needed to know where I was driving. “You need to know everywhere?” I asked. “So, Europe, basically?” he said. “OK, that’s fine.” He seemed to have given up. “This is the Post Office. It’s one giant repetition.” Cheery. The final stage was for him to stick my shiny photograph onto the new piece of paper, and hand it to me. I now had my International Driving Permit – a standard piece of green paper with stuff about driving licenses translated into a few different languages, with the details of my driving license copied onto the last page and a shiny picture of me stuck in it with a pritt-stick. So far, so excessively complicated. And we haven’t even left the UK yet. Cost: £5.50 (No credit cards allowed).